A…sketch presented Sunday looked at a letter sent…after the British fur trading post gave way to the U.S. Army outpost. One of the things that survived from the fur trading era into the pre-Civil War days was Chinook Jargon, a sort of local mash-up of languages spoken here, and only here. A patois of English, French, Sandwich Island (now Hawaii) and Native American languages, it was a way for people who gathered here from around the world to understand each other. And that Chinook Jargon was the focus of this second sketch. 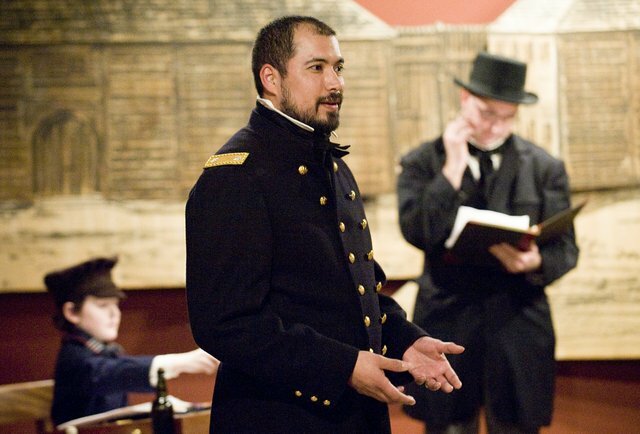 Ochoa played the part of Gen. Ulysses S. Grant, summoned during the Civil War to the office of Edwin M. Stanton, Lincoln’s Secretary of War. Dan Ochoa, Aaron’s father, played the part of the authoritarian secretary, who was concerned that Union generals traded insider information to enrich themselves in the stock market. So when he was presented with a letter to Grant from Gen. Rufus Ingalls apparently written in code, he demanded an explanation: What was this? Grant took the letter, and examined it. He read it, and explained that he and Ingalls were old friends from their Vancouver Barracks days, and used the code to talk earnestly among friends. And the translation? At that, the usually humorless Stanton burst out laughing. (But he apparently verified the translation some time later with another Chinook Jargon speaker).